This is an excerpt from the forthcoming nonfiction book Flowers in the Gutter (Dutton 2020), which tells the true story of the teenage Edelweiss Pirates who fought the Nazis. Through narratives based on memoirs, oral history interviews, and Nazi documents, I immerse the reader in the world of these teenagers as they resist the Third Reich. My first narrative nonfiction book, Flowers in the Gutter, will be published by Dutton in 2020. "Drawing from memoirs and other firsthand sources, the book chronicles the history of the Edelweiss Pirates, a group of German working-class teenage boys and girls who resisted the Nazis in Cologne during WWII." - Publisher's Weekly. This is an excerpt from Flowers in the Gutter (Dutton 2020), a young adult nonfiction book about the the Edelweiss Pirates, groups of German working-class boys and girls who resisted the Nazis in Cologne. This story has never been told in English, and uses the memoirs of Pirates who survived and the Gestapo archives as primary sources. The memorial for the murdered Edelweiss Pirates, Cologne, Germany. These stories come from my MFA thesis, titled The Midwife Problem. The project reflects on how U.S. women went from giving birth at home with a midwife to at a hospital with a doctor in the span of about twenty years. 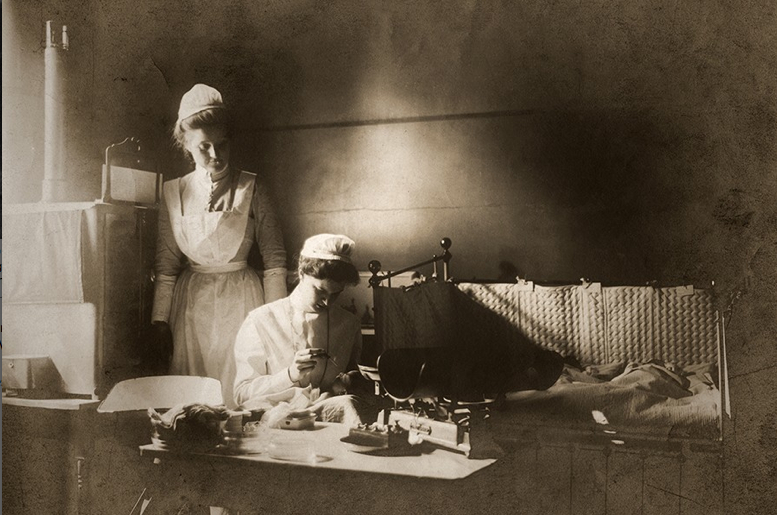 Carolyn Conant Van Blarcom was a Hopkins-trained nurse who was a part of the crusade for safe childbirth in the Progressive Era. This story explores one moment in the life and work of Rosa Fineberg, a midwife who immigrated from Russia to Baltimore at the end of the 1800s. The essay was a finalist in Proximity Magazine's 2017 Narrative Journalize Prize issue. What was life like before women could have epidurals? Read an excerpt from a piece on Twilight Sleep, the short-lived pain-management phenomenon, or read the full piece on OZY.com/flashback. "A Necessary Evil: The Midwives of Anne Arundel County" explores how midwives were treated in Maryland's rural areas. The excerpt from my MFA thesis won the 2015 Julia Rogers Research Prize from Goucher College. Cancer upends lives. These essays represent diverse perspectives on cancer, from my own experience being diagnosed with leukemia in my 20s, my friends' experiences, and stories from history. I saw the video of a young woman who wanted to die on her own terms, and I knew exactly how she felt, so I wrote an essay for The Washington Post. Cancer patients look for magic, a cure when the odds are poor. Thousands of women were duped by a doctor who had exploited Black women in post-Apartheid South Africa. Read more at OZY.com/flashback.